The rate at which people are disappearing is now becoming a national security matter. Why are activists disappearing in Kenya? Who is taking them and why? Days after human rights activist and campaigner against extra judicial killings went missing, her husband now says his own life is in danger. He said he fears he could be the next target. 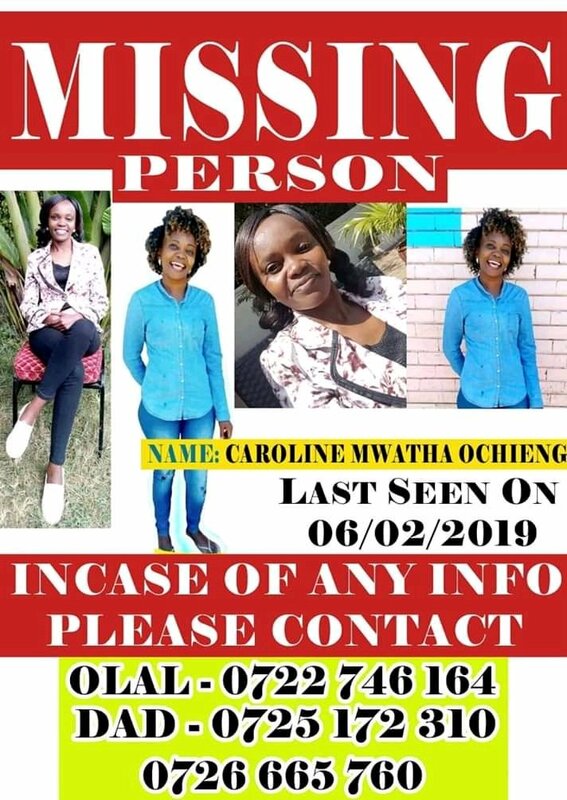 His wife, Carolyne Mwatha, was reported missing since Thursday last week. Her husband, Joshua Ochieng’, a Dubai-based trader, told the Star the disappearance of his wife of 20 years has left him scared for his life and the lives of his children. He did not cite a specific threat to himself. A demonstration will be held today to demand speedy investigation and justice. Ochieng’ said he flew back on Sunday to join the search for his wife. Mwatha was a senior manager and founder member of the Dandora Community Justice Centre. It is a human rights lobby group, famous for documenting cases of extrajudicial killings and police brutality. Ochieng’ communicated with his wife via WhatsApp on Wednesday. “We were chatting almost the whole night on Wednesday. On Thursday morning, she texted me good morning but due to time difference, I responded late,” he said. He said he unsuccessfully tried calling Mwatha on Thursday. Twice, someone received the call but did not speak. “I called her many times when I woke up, but she was not picking. I thought it was normal because it was a working day. I assumed she was holed-up in meetings as her job is demanding,” Ochieng’ said. Ochieng’ said he got alarmed when his wife failed to return any of his calls and reached out to her workmates, who told him she had not reported to work. “I called her number again and on two occasions, someone would pick up but did not speak,” an emotional Ochieng’ said. He expressed anxiety over the safety of his daughter. “My wife went missing while taking our daughter to school,” he said. “I’m not sure how safe my daughter will be,” he said. Wilfred Olal, the coordinator of the Dandora Community Justice Centre, said Mwatha had not reported receiving any threats to her life before. He is the convenor of all justice centres fighting police brutality and extrajudicial killings in Nairobi’s informal settlements. “We cannot rule out anything. The nature of the work we do is really risky and as a centre, we receive numerous threats,” he said. A Nation Centre employee recently disappeared and was found dead, making Mwatha’s disappearance especially unnerving. Midred Odira was missing for a week and her body was found last Monday at City mortuary. Police had promised to extract Mwatha’s last call logs from Safaricom and release them to the family yesterday, but this did not happen.